You must be an ASCD member or subscriber to view this content. Freddie Gray's death tore a city apart, but these shaken teens found their power in the aftermath. The city had been tense as he lay in a coma. During that time, my art students at Mergenthaler Vocational Technical High School in Baltimore City would be quietly talking while drawing and suddenly break out into an argument about Freddie Gray's arrest. "Was he innocent in all this?" "Was it fair that they arrested him just because?" The names of Trayvon Martin, Eric Garner, Walter Scott, and Michael Brown would brush against their lips like angry prayers. When news spread of Freddie Gray's death on April 19, 2015, the city erupted. My husband, Morgan, who was teaching on the West Side, called me during lunch. He said social media was flaring up. Something was about to go down. "They are calling it the purge." Soon after I got that call, Mr. Rivers, my principal, came on the intercom. He had decided to cancel all afterschool activities to make sure that our students got home safely. And with deliberate tension in his voice, he warned "… be mindful of what you connect yourselves to." Brandon (a junior) and I were setting up a student show that afternoon at Morgan State University when our phones started buzzing. As I spoke to Brandon's mom and then to my husband again, I stared at my students' self-portraits. Their coy glances, slanted smiles, determined gestures. The riots had started. Public transportation had been suspended in parts of West Baltimore. The kids had no way in or out. "What about your students?" I asked Morgan. "They won't be able to leave the area. They are trapped," he responded. Trapped in their skin tone, I thought. I'd been familiar with statistics about the treatment of black youth by police in the United States. Not only are they five times more likely to be arrested or incarcerated (The Sentencing Project, 2017), but black youth are subjected to alarmingly high rates of police harassment (Kaba, 2014). At the time, I was overcome with fear for the beautiful brown sons and daughters who fill my classroom with their dreams and laughter. And I cried as I thought of their mothers. That night my students started texting me. "Did you make it home OK?" "Are you safe?" "Are you with your family?" "Are you scared?" As I read the messages, I realized that they weren't necessarily questions, but reflections of their own fears and worries. That Ty-Shawn maybe wasn't with his family and Shamar didn't make it home and Debra was scared. And my kids, my students, were not safe. "Are people throwing rocks on your street?" "Are there fires?" I stayed up all night. I responded as the texts came in and reached out to the students who I knew lived in West Baltimore. It was a long night, and I was relieved when schools were closed the next day. They remained shut for two days, and when we returned, our administration had brought counselors in to help students through the trauma. Student self-portrait by De'Quan Hanna. The trauma, however, lingered well beyond the riots and subsequent "not guilty" verdicts. The uprising in Baltimore City was not only about Freddie Gray's death, which occurred while he was in police custody. It was also about a culture built on racism (New York Times Editorial Board, 2016). I walked into my classroom early that morning when schools reopened to find my students already there. Some still with their hoodies over their heads, their artwork in front of them, arms folded. The ones trickling in hugged me, as I scanned the room relieved to see that they were all safe. We sat in silence. How could I start the conversation? What conversation was to be had? We as a class had never discussed the circumstances my students lived through. They were proud and resilient, and I respected their privacy. "Have the police ever bothered you?" I finally asked. The young men in my class lifted their heads sharply. "I'll be walking to school, mindin' my own business, and they be stoppin' me. Ask me where I'm goin'? What you mean where I'm goin'? It's 7:00 in the mornin' and I got my backpack!" They started telling me stories of being frisked, pushed down to the ground, roughed up. I looked over to Dasia and caught her eye. She stood up, walked over, and sat next to me. "My heart leaps out of my chest when I hear the police sirens or see their lights. They've broken down our doors so many times in the middle of the night. Looking for my uncle, my cousin. …"
"These things happen every day, Ms. K," Jada joined in. "And we need to be mindful of the people in our neighborhoods. When I get off the bus, I go home as quickly as I can, runnin' past the dealers, the people in the street. I talk to no one. My grandmother doesn't let me out the house 'til I got to go to school the next day. I trust no one! Not the police, not the brotha' I grew up with." I looked at my kids. They were the unraveled threads of their community's fabric. The village that had raised me so lovingly never existed for them. In my own practice as an artist, my ultimate goal is to bring people together and build community. My work is informed by the vibrant exchanges that I witnessed as a child in the villages of Greece. But I was also raised as an immigrant daughter in a Greek diner, in the heart of Baltimore, where I served pizza to the locals before I could see the tops of their tables. Both of these worlds defined me. As an artist and urban teacher in the city of Baltimore, I felt an affinity with my students and wanted to bring the experiences of my upbringing into my practice. I knew I needed to use whatever gifts I had been given to help my kids heal and grow from the events surrounding the death of another black man. Students in Sia Kyriakakos's high school art class create charcoal self-portraits and Kehinde Wiley inspired depictions of "power poses." I realized that my classroom could be the incubator of community building and self-actualization for my students. I wanted them to see themselves as powerful in a world that had rendered them powerless. I wanted them to see their beauty inside and out, cutting through the fog of self-doubt. I wanted them to take those insecure lines that they came to me with (almost afraid to draw at first, their hands would tremble or they would press too hard on their pencils) and create confident self-portraits that defied their set societal trajectories. I am black, Born in Baltimore. Its streets call to me. … Most of my family is sick or in poverty. They try so hard but nothing seems to go right. I don't want to grow to struggle like them. I don't know who I will be. But I won't be the father that is not there. I don't want to be … my father. My students listened and opened up one by one. Some cried, sharing in the most honest voices they could muster. The city and its struggles had not been kind to them, nor did they see it changing soon. However, they were witnesses to each other's lives in such an intimate way and had finally begun to express their deep, conflicted feelings about the Baltimore unrest. We moved from spoken word to visual expression. I introduced my students to the work of African-American artist Kehinde Wiley, and they were instantly captivated. Wiley, who was later commissioned to do the official portrait of President Obama, creates magnificent realistic paintings of black and brown people that confront issues of identity and empowerment. His process involves appropriating the style and "poses" of the works from the time of the Renaissance and before. In those original paintings, the models are of royal descent—the rich, the martyrs and saints found in Christian iconography, the nymphs and gods of ancient Greece, all white Europeans. Wiley asks his subjects, everyday people of color, to look at art history and pick the painting they would like to emulate. In similar fashion, I asked my students to think about their notions of power, their values, their place in society and history. We dedicated a unit to exploring art history and debated its deliberate absence of the black body. After we researched and discussed the African-American condition in this context, my students felt empowered to begin painting their self-portraits—Afrocentric depictions of strong women with gravity-defying hair and fists rising, and young men posturing, brave enough to talk about street violence, police brutality, their anger, and the helplessness they feel. The process gave my students time to reflect and mourn. While learning about composition and grappling with techniques, they questioned their own responsibility within the context of their communities and defined what their cultural contribution would be. They spoke their successes. And I saw it in the brush strokes they made. It was a visceral, powerful experience. "I did this," Carla told me, as she proudly looked at the girl breaking out of cuffs in her painting. "I can break through anything, now. I feel like I was asleep, going through the motions. Now I am woke and ready." We took these paintings and hung them all over the school. The other students stopped and looked. They talked to each other. The school police stopped and looked, too, and talked to my students. We then took the paintings and hung them all over the city: at community centers, in local pop-up events, in regional art shows. And the students were ready to discuss their artwork, to share who they were and where they came from. They reclaimed their space in society. In the most graceful of ways, they found the power within themselves, through art. They became ambassadors of their own culture, and in turn brought those experiences and conversations back to their school and their peers. Three years later I have developed a full curriculum designed to heal and empower my students, take ownership of their city, and see themselves belonging to the greater world in an impactful way. It starts with that same writing assignment (a song or a poem) about who they are. The first project investigates the beauty and history of Baltimore. The students are asked to interview older family members about significant events of the past and notice the differences in today's neighborhoods. They then photograph architectural details of the city's blighted, decaying buildings, which allows them to discover the beauty that exists around them despite time and neglect. The project culminates with a clay sculpting assignment: their personal interpretation of an urban row home. The second project, "Día de Muertos," is inspired by the multiday Mexican holiday that focuses on gatherings of family and friends to pray for and remember family members who have died. Being careful not to culturally appropriate the art forms of this spiritual celebration (through attention to context, emotion, and intent) nor disrespect its heritage, we develop art and poetry remembering and celebrating those lost in the streets due to violence. My art room becomes the students' home, and their pain lightens and is transformed into art through the creation of Day of the Dead sugar skulls. Using cake decorating and piping techniques, my students decorate the skulls to portray the things they loved most about the person gone. It gives them an opportunity for closure, to say what they never had the time to. These gentle emotional exchanges enrich and bond us as a class. We become family. Through the third project, my students develop focus, patience, and perseverance while learning how to draw realistic self-portraits in charcoal. Drawing is a process of editing and revising. The practice of observing and continually correcting allows them the time to see themselves come into focus, clearly for who they are. Drawing blocks the outside noise, forcing my kids to start asking existential questions: "Who am I?" "How do I want to be perceived?" They see themselves with new eyes, full of potential. The final project is the Kehinde Wiley "power pose." It involves independent research on the artist; an overview of art history and its discourse on society's power; a writing assignment investigating and claiming one's own values and notions about power; and the eventual development of a painting or photograph where the students portray themselves as powerful. This last project synthesizes and distills the knowledge of the semester. The students feel like they have worked hard on themselves and their skills. They have gone through a creative transformation. 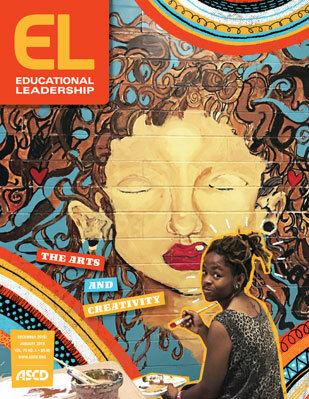 Our school is now wrapped with powerful student self-portraits, and my students—who initially come to me with little or no art skills for their one Maryland art credit requirement—are now winning prizes and scholarships for their work. To educate the whole child, we need to address their trauma and support their social-emotional learning. Art can and should be part of this process. This is hard work, for both the student and the teacher. We become the home, the parent, the shoulder to lean on—and we do it with love. These are my fighting words: I do not want to lose another student to the streets of Baltimore. Together we need to make sure there are no more Freddie Grays. Sia Kyriakakos (2nd from left) stands with her students as they proudly display their artwork in an annual school exhibition. * Author's Note: D'Sean is a pseudonym. Sia Kyriakakos teaches art in Baltimore City, and her classroom is home to every student who walks through the door. She was the 2017 Maryland Teacher of the Year and a National Teacher of the Year finalist. Follow her on Twitter. For photocopy, electronic and online access, and republication requests, go to the Copyright Clearance Center. Enter the periodical title within the "Get Permission" search field.